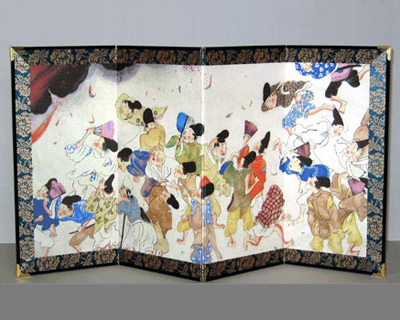 Design: This four-panel screen depicts the legendary fire of 866 at the Otenmon Gate - a structure vested with great symbolic importance - of the Imperial Palace, Kyoto. Size: 31x14.6 cm (12x5.7 inches) per panel. Design: This four-panel screen depicts the legendary fire of 866 at the Otenmon Gate - a structure vested with great symbolic importance - of the Imperial Palace, Kyoto. Ban Dainagon, after a conflict with another government official, was alleged to have set fire to the Otenmon Gate and then tried to pass off his crime on a political rival. Eventually the truth was accidentally revealed through a children’s quarrel, leading to the downfall of Ban. The truth, though, has never been confirmed. In painting this scene, Kurashima-san would appear to be criticizing the venality and scandalous nature of present-day Japanese politicians.